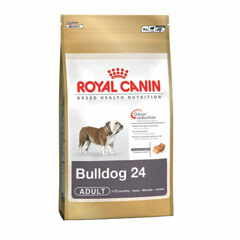 Royal Canin Bulldog 24 is specially formulated for the needs of bulldogs. It is easier for the bulldog to grasp and chew, and improves the skin's efficiency as a protective barrier, while promoting good digestion and reducing flatulence. Tailored nutrition for bulldogs (12 months+).